After floundering for most of DC Comics’ New 52, Supergirl is finally getting the respect she deserves in the current Supergirl comics. Writer Steve Orlando and artist Brian Ching have taken the main Supergirl ongoing in a strong new direction by incorporating elements from the Supergirl TV show, and writer Mariko Tamaki and artist Joëlle Jones are giving Kara Danvers a grounded new origin story in the Supergirl: Being Super miniseries. DC has been doing exceptional work with its revival of “Prestige Format” miniseries, which are printed on high-quality paper with glued binding and cardstock covers, and both Supergirl: Being Super and the recently concluded Deadman: Dark Mansion Of Forbidden Love are outstanding reads that merit the upgrade in production quality. Being Super is building a strong emotional foundation for Kara Danvers that is rooted in relatable teenage experiences, and the manifestation of Kara’s Kryptonian abilities functions as a metaphor for the physical changes of puberty and how that affects a person’s thought and emotions. Tamaki’s work on graphic novels like Skim and This One Summer showcased her talent for getting into the minds of teenage characters, and that skill has been a major boon for Being Super, which offers a depiction of Kara Danvers that is easy for readers to empathize with and connect to. The art team of Joëlle Jones and colorist Kelly Fitzpatrick brings Tamaki’s narrative to life with crisp clarity and powerful feeling, and after focusing on quieter storytelling in the first issue, the team gets to bring some superhero spectacle to the page in this week’s Supergirl: Being Super #2. 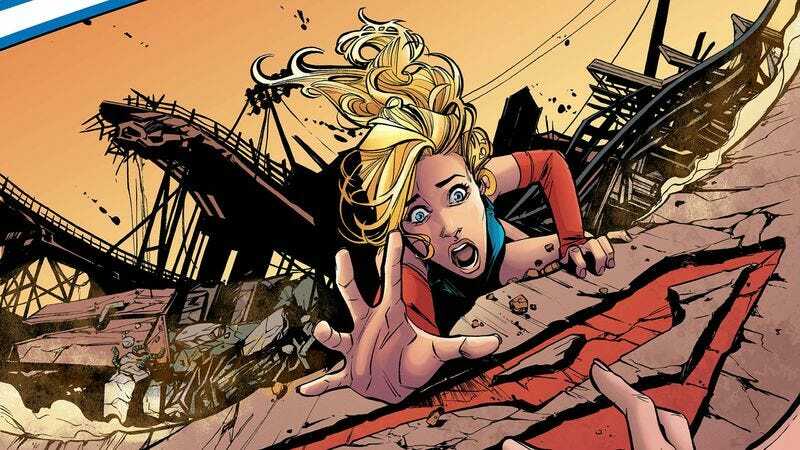 This exclusive preview has Kara leaping into action to save her friends in the middle of an earthquake, and Jones captures the scope of the devastation and the ensuing chaos in her compositions while Fitzpatrick intensifies the action with a warm color palette. Jones’ evocative facial expressions and body language heighten the stakes in these page, and the idea of evoking Supergirl’s costume in Kara’s track uniform is a very clever way of connecting Kara to her superhero future while keeping her rooted in a reality. She’s well on her way to being a superhero, but first she needs to survive high school.